A minimum of four people are required for a tour. Weather policy: Tours are only cancelled if conditions are unsafe or by mutual consent of both Kayak Melbourne and the customer. Tours are not cancelled due to cold weather, hot weather, light rain or light winds. Kayak Melbourne reserves the right to cancel a tour due to heavy rain, strong tidal currents, poor visibility or strong winds. Experience Melbourne from a different perspective on a unique guided kayaking tour of Docklands and downtown Melbourne. 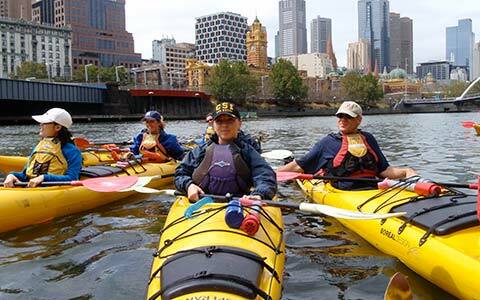 Take in the awesome views of the city skyline as your sea kayak winds its way down the Yarra River, before tucking into some tasty fish-and-chips, a special 'on water' dining experience. Some of the highlights of the tour include seeing the Crown Casino, Southbank, the dramatic “fire-ball” display, Flinders Street Railway Station and the Princes Bridge. Get ready to see Melbourne from an entirely new perspective! This tour is available for all ages and no experience is necessary since the boats are fibreglass Sea Bear sea kayaks, which are easy to operate.